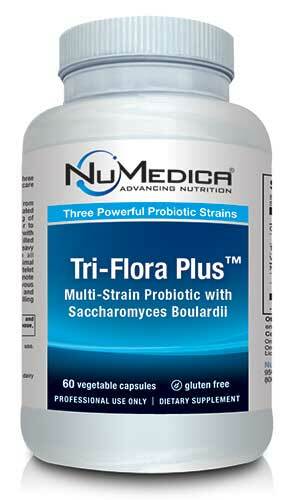 NuMedica Tri-Flora Plus contains a probiotics formula that is outstanding for defending you against bad gut bacteria. NuMedica partnered with the revered Institut Rosell to create this clinically proven multi-strain probiotics formulation containing a concentrated combination of Saccharomyces boulardii (SB), Lactobacillus and Bifidobacterium. This triple-strain probiotics formula can withstand gastric acidity and salts in bile to provide protection for the gut and intestinal tract. 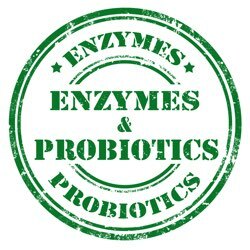 Probiotics are living bacteria that complement your health. 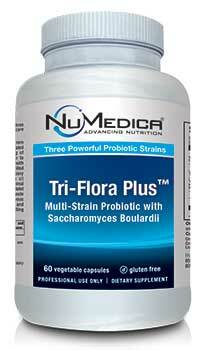 NuMedica Tri-Flora Plus offers three lines of defense with its effective probiotics combination. Saccharomyces boulardii adheres to pathogens and is known as a yeast superstar. This yeast can stimulate your immune system response so that you can ward off infectious pathogens. Because Saccharomyces boulardii is resistant to antibiotics, it can work in tandem with antibiotics to remove unwanted pathogens from your body. 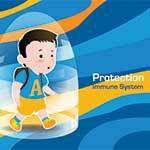 Lactobacillus can reinforce your intestinal barrier. Naturally found in our intestinal tract, this good bacteria is ideal for preventing and warding off diarrhea. 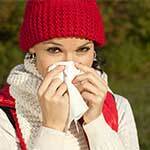 With its ability to boost the immune system, this type of bacteria can help ward off infections too. Bifidobacterium can help keep you ph balanced and promote optimal intestinal health. Whether you want to maintain the health of your GI tract or restore it to improved health, NuMedica Tri-Flora Plus is an excellent way to naturally help your body ward away infection too. If you suffer from certain gastrointestinal problems like IBS, this probiotics formula may reduce your symptoms and improve the function of your gastrointestinal functions. Directions: Take one capsule before or during each meal or as directed by your healthcare practitioner. Shipping: Product should be shipped with an ice pack if there is risk of prolonged exposure to temperature exceeding 90 degrees. Supplementrelief ships with an ice pack at 75 degrees or higher. Below 75 degrees an ice pack is not necessary but may be requested in the order notes for an additional charge of $4.95. Free of: Eggs, fish, shellfish, tree nuts, peanuts, wheat. Storage: Refrigerate after opening. This product may be shipped refrigerated to prevent prolonged exposure to extreme heat though it is not necessary to arrive cold.